Longstanding talks to curb Iran's nuclear programs have finally come to a head as Secretary of State John Kerry met with both Iran and Russia's foreign ministers yesterday. Today marks the deadline for negotiations on the matter, but after yesterday's meeting it seems that the possibility of an extension still stands. Such negotiations have been the cause of ongoing tensions between Iran and the U.S., and while many are eager to reach an agreement, all parties are finding difficulty reaching a compromise. As the fight against ISIS rages on throughout the Middle East, Vice President Joe Biden paid a visit to Turkey to discuss potential options for turning the tide of battle. Unfortunately, the two countries have decidedly different interests in the matter; where the U.S. wants to see the Turkish government offer more support in the fight against ISIS, Turkish officials are more interested in removing Syrian president Bashar al-Asad. It seems the recent rash of tragic police shootings in the U.S. continues as a Cleveland police officer shot and killed a 12-year old boy in Cleveland this past Saturday. 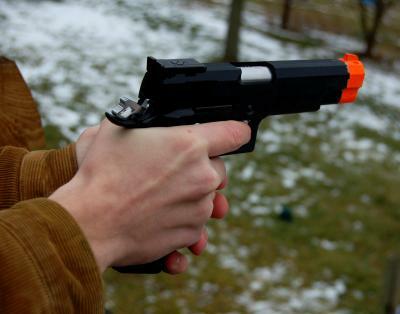 Police received a report of someone brandishing a gun near a playground, and when they arrived on the scene they encountered the young boy who was carrying a replica pellet gun that was missing its orange identification tip. A police spokesman has stated that the boy did not confront or threaten the officers. Pennsylvania-native Jordan Konell made headlines this weekend when he was named one of the 32 U.S. Rhodes Scholars. Konell is currently enrolled at Yale where he is pursuing a degree in African-American studies and political science. Through his scholarship, the young man will go on to pursue a master's degree in Comparative Social Policy at Oxford University. Conneaut Lake Park, which was slated for sale in the sheriff's auction, may remain a local landmark thanks to a petition filed by the Pennsylvania Attorney General's Office on Oct. 1 of this year. The petition argue against the park's sale on the grounds that it is a charitable trust intended for public use. The sale has been delayed until Dec. 5, pending yesterday's hearing.